Whether being used for 24/7 data gathering, 4K video surveillance or big data server applications, reliable and scalable storage solutions are a growing concern for today’s hardware users. As such, we’ve seen many of our clients moving to hot-swap hard drive management to help streamline the data storage, access and archiving process. 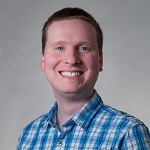 As with all technology, changes in standards and hardware can have a far reaching impact, and one fairly recent evolution in storage technology has the potential to cause headaches for those unprepared to make the requisite adjustments. We spoke with Logic Supply Support Technician Michael Dalius about a key specification of today’s storage drives and hot-swap bays that you should be aware of. 1) What are the differences between storage drives and hot-swap bays that users need to be aware of? 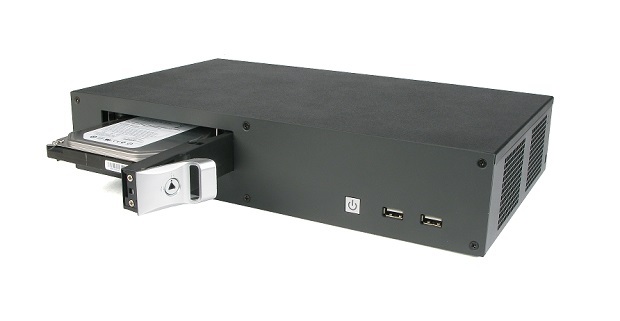 Mike Dalius: 2.5″ SSD and HDD storage drives are available in different heights. Most of the drives that Logic Supply sells are either 7mm or 9.5mm tall. While there are hot-swap bays built to accommodate different drive heights, 10mm hot-swap bays tend to be the most common. 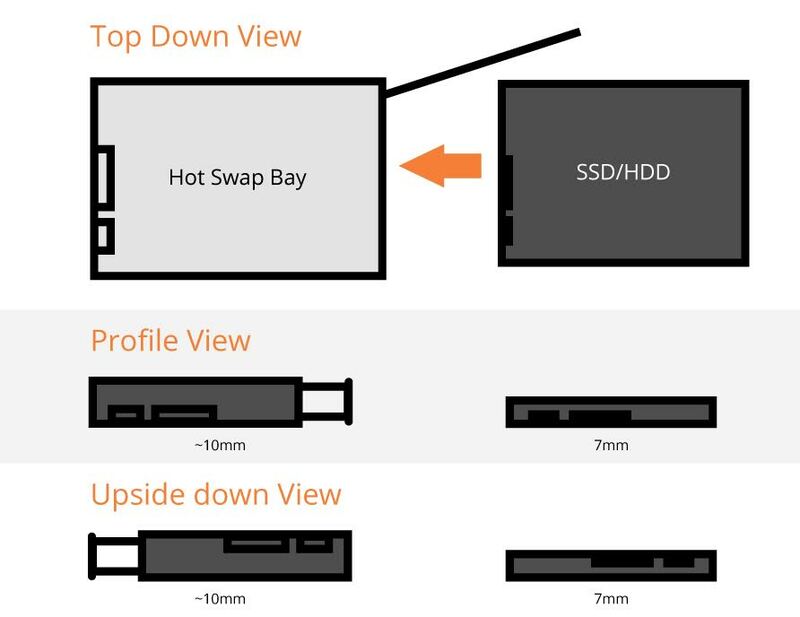 This means, if your drive is not high enough to fill the entire hot swap bay, it may not line up correctly with the corresponding SATA connector within the drive bay. An additional complication that we see from time to time is that, depending on the system, the hot-swap bay may need to be installed upside down. This doesn’t present any issue as long as the storage drive being used fills the entire bay, but once again, if the drive is smaller than the bay, gravity will work against you to cause a disconnect between the SATA connector and the drive. 2) What is the solution to this issue? MD: If a 7mm drive does not line up with the SATA connector in the hot swap bay, you can use a 2.5mm spacer to fill the rest of the space. The spacer is simply attached to the drive and makes the effective height of the drive 9.5mm, ensuring proper contact with the drive connector. 3) What do people need to be aware of when configuring systems with hot swap bays and then choosing storage to fill them? MD: If you remove and reinsert a hard drive into a hot swap bay, and it’s no longer detected by the system, look for extra room between the drive and the top of the bay. If you look into the bay, you may see the internal SATA connector on the top of the bay. If possible you may be able to simply flip over the system and insert the drive, but this isn’t always a practical solution. At Logic Supply, we add spacers to our 7mm drives to ensure proper fit in 9.5mm hot-swap bays, which resolves this issue. Alternatively, you can purchase 9.5mm tall drives, but understanding the differences between hot-swap bays and storage drives will help you avoid this type of frustration. 4) What are some real world examples of how hot-swap storage is used? MD: Let’s say your system has two identical hard drives, which you’ve configured into a RAID 1 array (learn more about RAID here). This means the saved data is identical on both drives. This mirroring is a great failsafe against system downtime because if one drive crashes you’ll still have all of your data on the other drive. Pairing this with a separate backup solution provides both high availability and high reliability. By utilizing a hot-swap system you can easily change out a drive should one fail or remove one of the drives without interrupting the data writing on the other drive. In another example, let’s say your business runs all the same software on all of the computers on your factory floor. In many manufacturing facilities, the most common point of hardware failure is hard drives. Airborne contaminants, extreme temperatures and exposure to high levels of vibration can all contribute to hard drive failure, particularly if you aren’t utilizing a solid state storage option. Without a hot-swap solution you lose hours of time when a hard drive fails because you have to remove the mounted system, send it to IT, wait for them to open it up, replace and test the hard drive, and reinstall the system. With a hot-swap bay you can keep multiple spare preconfigured hard drives on hand, and swap them out on the floor, saving your business an incredible amount of time and money. These are just a couple of basic examples of hot-swap storage in action. Because of the flexible nature of SATA drives, hot-swappable HDDs or SSDs are a great option for a huge range of applications. But as with any hardware feature, it’s important to understand the limitations and potential stumbling blocks. If you have questions about hot-swap storage, or any of the features of our industrial PCs, don’t hesitate to reach out to one of our Solutions Specialists. What Exactly is an Industrial NUC? The 2016 Product Catalog is Here! Hi Andy, thanks for your question. The only requirements for hard drives within a hot swap bay are the size and interface. If your hot swap bay is compatible with 2.5″ drives and has a SATA interface, then pretty much any 2.5″ SATA hard drive should work. Just make sure, as mentioned in point 1 above, that the height of the drive (commonly called the z-height) is compatible with your drive bay. Help. I have an older Glyph Trip with 2 hot swappable Seagate Cheetah hard drives in sleds that I use with Pro Tools 5.1. I am having trouble finding additional hard drives already in the sleds. Any suggestions. Thanks. Hi James, thanks for reaching out. Unfortunately we’ve never worked with Glyph racks so we’re not in a position to offer much help. Have you reached out to them directly (tech@glyphtech.com)? I want to know whether OS gets notified about hot-swap of HDD/SSD? If yes, then please tell me how?